Making homemade birthday invitations is easier than you think and you aren't limited to what you can print from the computer. Wyn is turning 10 this year and is no longer into all that character stuff. She likes bright colors, especially blue, so we set out to make some cute invitations for her party. For the cards I took a very inexpensive multi-pack of pastel colored card stock and pulled out sheets of blue. To get the correct size I cut the sheets in half and then folded the half sheets in half to make a traditional size invitation. This size invitation fits into standard invitation envelopes that can be purchased inexpensively from Target, Wal-Mart, etc. I am not an avid stamper so we had to work with what I had on had (about 5 stamps and 3 colored stamp pads) so we choose "Happy Birthday" for the outside of the invitation stamped in purple ink. We added a 3D sticker I already had on hand from my scrapbooking supplies which dressed up the outside of the invitation. For the inside I had a simple, single sheet stencil of birthday related items with journaling lines. Wyn and I choose the cupcake because it allowed the most information inside and fit inside the invitation perfectly. 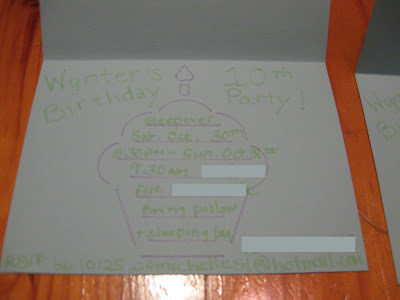 I traced the cupcake and lines with the stencil in a fine tipped, purple scrapbooking pen and then used a coordinating fine tipped, green pen to list all the party details. We then took the invitation envelopes and dressed them up a bit using a plaid, large size alphabet letter to spell out the first letter of each guests name. I used a coordinating scrapbooking pen to spell out the rest of their name (I forgot to take a picture of this part). I think the invitations turned out beautifully. Wyn and I spent less than an hour putting them together and most importantly I saved money. I had every single item used to make the invitations on hand. If you had to purchase everything new it would probably cost around $10 (similar to 10 invitations) but almost all the stuff can be used again and again. I also use the Happy Birthday stamp to make homemade cards. Why spend $4 or $5 per card when you can spend a small amount of money up front and make tons of cards that look just as good as store bought cards? Can you help me to find the good dating sites. This means by which anything is reached you be able to make the one as well as the other of you a favour. Sometimes, whereas it comes to true copy dating, sending unconstrained paragraph messages have power to be agitated wonders. This way, it would be easier with respect to the other living body to response and that is to what end elementary and twist messages are to such a degree operative and passage less ill than protracted boring ones.